Accurately track all assets across all global data centers. Quickly see space, power, network connectivity, and cooling capacity. Manage, validate, and report on change requests and work orders. Boost energy efficiency, reduce costs, and drive energy-saving initiatives. Intelligent monitoring to help you maintain the health of your data center. Reduce downtime and find stranded capacity with complete power monitoring. See 3D views that display everything from a bird’s-eye view of the data center floor. Secure cabinets with electronic door locks, auditing, surveillance, and role-based permissions. Explore zero-configuration dashboards and visual analytics that work right out of the box. Manage power and network connectivity with visual trace routes, cable measurements, and port connectivity. Remotely navigate your data center as if you’re there. See rack and row elevations. Correlate multiple space, power, and environmental reports for a real-time, accurate view of data center capacity. Isolate cabinets to view where and how devices are placed and connected. Analyze sensor readings for entire rows and racks in a single screen. Sunbird’s better-than-being-there 3D floor map visualizations help you stay informed about what’s going on in your data center—without leaving your desk. Weather Radar for Your Data Center. Forecast and address changes in your data center environment before they become problems with speed and agility. Spot temperature, humidity, and air pressure trends over time to maintain a safe operating environment, save money, and avoid overcooling. Identify and predict hotspot formation across your entire data center floor map. Sunbird’s 3D thermal maps and time-lapse video work with environmental sensors already deployed in your data center to make it easy to collect accurate high-quality data. See how assets are exactly connected in 3D, down to the individual device ports. Visualize all the cabinet hops on your data center floor to quickly identify network and power connections. Isolate and zoom in to view device connections across cabinets. Sunbird’s DCIM software enables you to document and understand every node in your network and power circuits to identify single points of failure and decrease troubleshooting time. Stop wasting hours creating, updating, and managing rack diagrams in Visio. Search, sort, and filter assets in cabinets from any data center location. 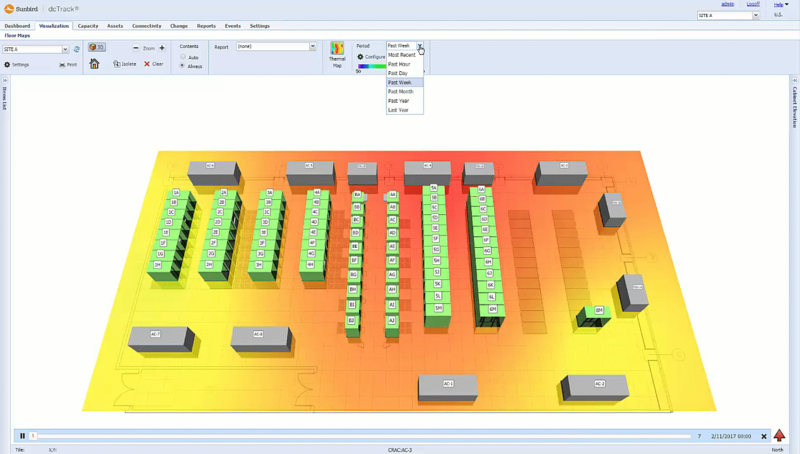 Visualize contents of multiple racks across any site to view real-time capacity. View granular, detailed information on individual assets with a single click. With automatic cabinet elevations created with data and images from Sunbird’s 30,000+ Models Library, you can skip the manual effort and see what’s inside without walking the floor. Make smarter, more informed data center management decisions based on accurate, high-quality data from Sunbird’s zero-configuration dashboards. Leverage out-of-the-box business intelligence for immediate insights or display just the data you want with customizable widgets. Filter data for faster, pinpointed analysis or export for use in a third-party system. Secure, shareable links respect role-based, granular permissions while helping you drive a culture of data collaboration around common data center KPIs. Drill down into the details of over 75 interactive reports to find the answers to your biggest questions. View summary panels for an overview of your data, or filter to get just the most relevant dataset. Display or hide data points with one click to more easily spot trends or focus your analysis on just the data that interests you. Sunbird’s out-of-the-box and custom reports provide reporting options to address your most common data center challenges. With Sunbird’s Open Web Services API and user-configurable CMDB connectors, integrate your DCIM software with BMC Remedy, ServiceNow, and other existing ticketing systems to save time and reduce inaccuracies. Synchronize data across your DCIM database and CMDB. Eliminate duplicate requests, bottlenecks, and delays resulting from manual effort. Manage and report on your requests and work orders so you’ll always know what’s changing in your data center. Reserve space, power, and connectivity all at once. Sunbird’s DCIM solution leverages real-time data for seamless, just-in-time reservations across multiple users on multiple projects. Simply select your location and criteria to find the ideal cabinets to deploy new assets in minutes. Instantly reserve cabinet space or place items once you’ve identified the location. Results are validated for data and power port compatibility to ensure you have all the capacity you need. Take DCIM for a Spin. From Creation to Completion, Seamless Work Order Automation. Speak with a DCIM specialist to learn how to automate manual and time consuming processes, better manage your power chain to ensure redundancy and efficient capacity utilization, and keep accurate track of your data center assets for informed decision making. "The largest improvement that I see is being able to monitor power usage in our lab and making sure that our PDUs don’t get overloaded. We’ve gone through a few retirement phases and we can track that with the graphs in PIQ — we see the power usage going down. Being able to see the temperature throughout our lab is also pivotal." "There is a need to increase efficiency through technology...data center infrastructure management tools like dcTrack help you with power management, capacity planning and change management. System monitoring tools help you track the health of the network." "We use Power IQ to generate monthly energy-trend reports that provide customers with actual usage levels by server and IT device….it enables us to provide our customers the ability to run their own reports and to securely power cycle their equipment via a Web interface. Our customers [are] able to take a more active role in managing their servers and their energy utilization." Joining our team means being part of something great. Do you think you’d be a candidate? Sunbird’s robust library of resources including ebooks, data sheets, screenshots, white papers, and case studies are practically a virtual university.